The official youth disc of USA Ultimate is the Discraft J*Star 145 gram Ultimate Disc [pronounced 'JAY-star']. 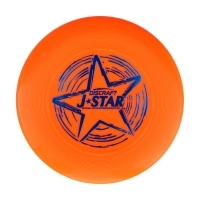 Now the J*Star is in our popular soft memory plastic that has made this disc even more popular. With soft feel and true flights, the J*Star Soft is sure fun to throw, great for the beach (it floats) and winter play. Note: Foil/print colours may vary.